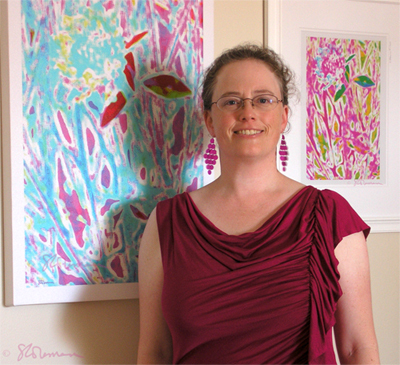 Suzanne M. Coleman pictured with 2 recent pieces of her artwork, one on canvas and the other matted and framed. Suzanne’s current work focuses on the beauty of nature in an effort to draw in people to appreciate and love the natural world around us. In order to reach those goals, Suzanne spends her time seeking out unique plants and flowers in Illinois prairies, forests and gardens and then collects photographs within these locations. She later employs computer software that translates the natural forms and colors of these plants into digitized artwork which emphasizes not only the seen, but also the unseen beauty of nature. Suzanne is an award-winning photographer whose work is internationally known. Her work is held in private collections in Chicago, Paris, Argentina, Honduras and California. My artwork, a mixture of science and creativity, just like me. Through this work, I want to inspire joy and wonder in you as you take a closer look at the complexity of nature. I want to generate curiosity that will hopefully lead to a greater appreciation of and respect for our natural world. I am exploring the capabilities of modern technology to be used as a tool to express what I see in my own imagination. I use my digital art to reveal the hidden beauty in what we see around us. I explore the limits of color, vision, perception, and depth and what I have created exposes deeper truths. With these pieces, I have worked to enhance certain elements of nature that intrigue me beyond its beauty alone. I explore patterns, structure, and purposes of design, and at the same time I am suggesting the differences between what we see with our human eyes and what we aren’t capable of seeing that is there for other beings to see, such as colorations and patterns which are only visible in the ultraviolet spectrum of light which is beyond our natural visual capabilities, but which can be seen by many species of insects. All of the digital art in my recent work uses my own original nature photography. Through my hard work and dedication, I have developed my own unique methodologies and styles in digital art, as you can see here. As a result, these pieces are expected to increase in value as collectible art. You now have the opportunity to purchase these pieces. I am very excited about the work I am creating and that excitement is reflected in the images themselves. I hope that you feel it too.